I follow Misty Evans on Facebook. 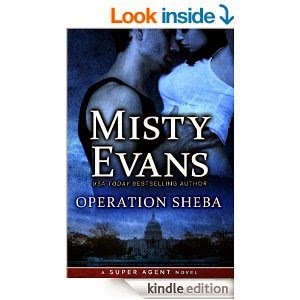 Operation Sheba written by Misty Evans. Julia and Con are more than just partners in the CIA they have become lovers. This time Con may have taken on the wrong terrorist group. The Berlin assignment ends tragically and Julia is called back to Langley to recover and change her identity and job. She no longer works the field but is one of the CIA's top terrorist analyst. She is recovering from her last assignment, has settled into her new persona and is even dating her Boss Michael tho they keep their relationship strictly business at work, no lunches together nothing to make tongues wag. Just as their relationship starts to solidify and Julia now known as Abigail has settled into her new life and job, a few ghosts from her past pop back up in her life. There are enough twists and turns to keep you guessing about what will happen next. Who will win the game that has been ten years in the making? The characters are believable and the bad guy is truly bad one that makes you wish you could help Julia put an end to this game once and for all. This is the first book by Misty that I have ever read, and it is safe to say it will not be my last. If you like espionage, intrigue and thrills with a bit of romance then this is the book for you.